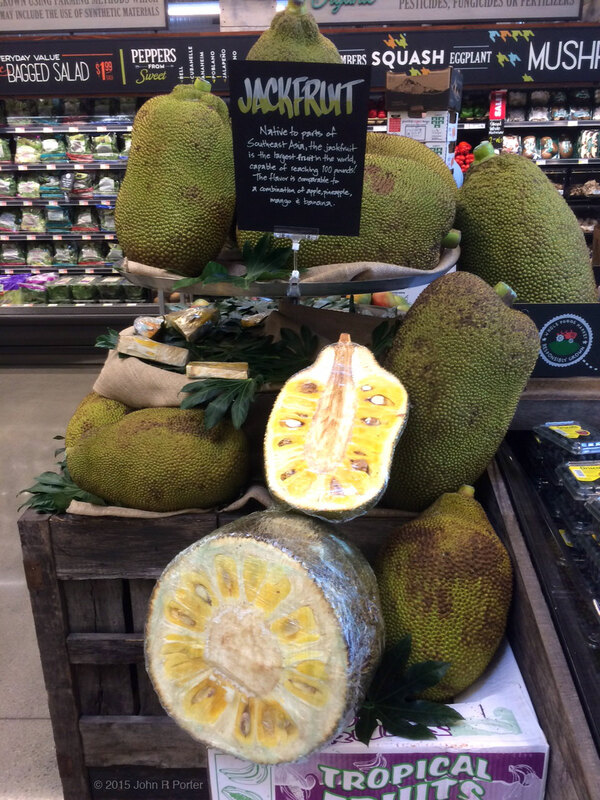 Jackfruit or Jac fruit is related to mulberry and fig, and is the largest tree-borne fruit. Usually they are 20-30 pounds, but up to 80#, even over 100# is possible. The tree is cold sensitive in the Treasure Coast and requires protection especially when young, but once a little older, they are similar in sensitivity to mango. The flavor is sweet banana/pineapple. Think Juicy Fruit gum. When cooking, the unripe or raw fruit is used and takes on the flavor of the sauce. It also makes a great curry or chili (chili recipe from June’18 meeting). Jackfruit, raw or ripe, freezes well once you cut it up. If fresh: When you pick a jackfruit, it is best to prop it against the tree with the stem down for several minutes to allow the latex to escape. 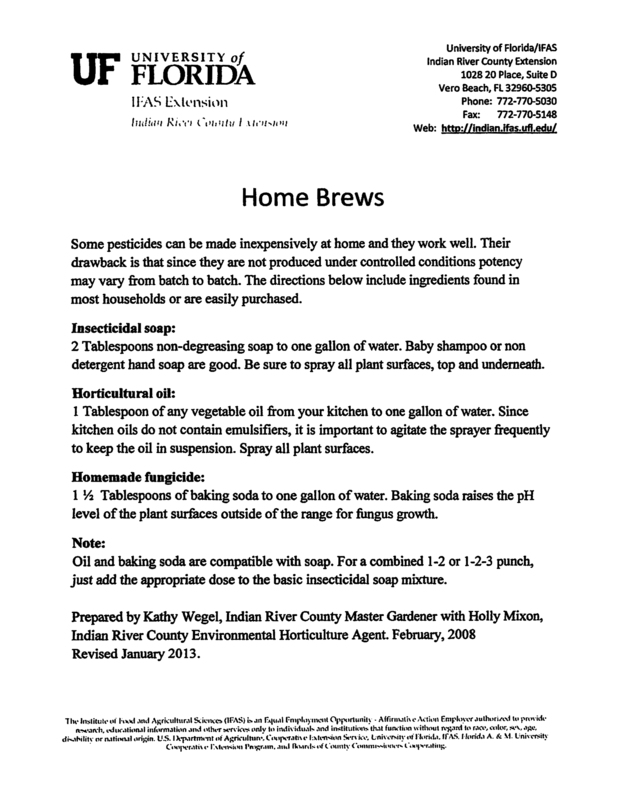 In a large stock pot bring salted water to a boil. Put a sheet of parchment paper on a cutting board, oil a knife and your hands and slice the raw jackfruit into round sections ~3/4″ thick. It may briefly ooze latex. Blanch the slices in the water about 20-30 minutes until you can stick a fork in it. Let cool, cut off the skin. Squeeze apart the rag & grate the core or cut into bite size segments. Use immediately or freeze for later. If you are preparing a large amount to freeze, it may be easier to use a food processor with a large shredder blade to grate the whole slices or half-slices. Divide them into freezer bags with one recipe per bag. Defrost in the fridge when ready to cook. 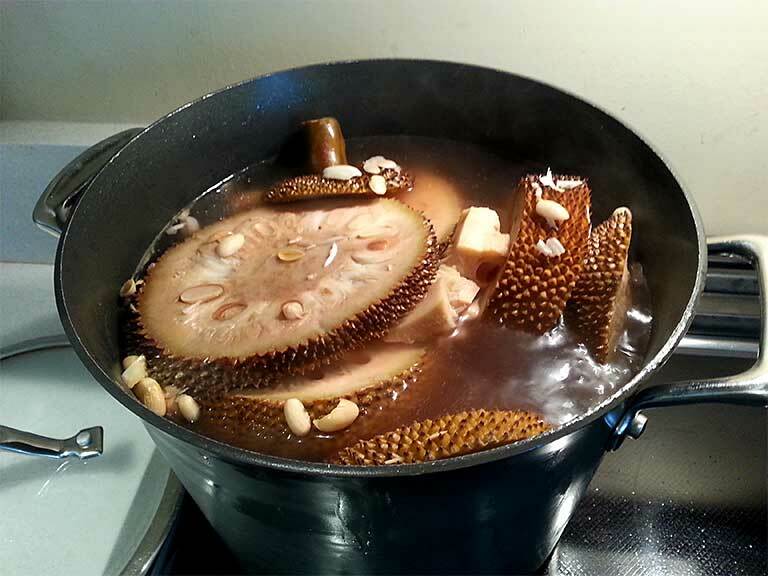 Drain and rinse the jackfruit in a strainer. Cut the core (the triangular tip) and grate or dice that part. The rest is the seeds and “rag”. Squeeze the rag to separate the individual threads. The seeds at this stage will be will be about 1/2″ the long way. Heat oil in a skillet over medium heat. Brown the cumin seed. Saute the onion and garlic 5-7 minutes till tender. 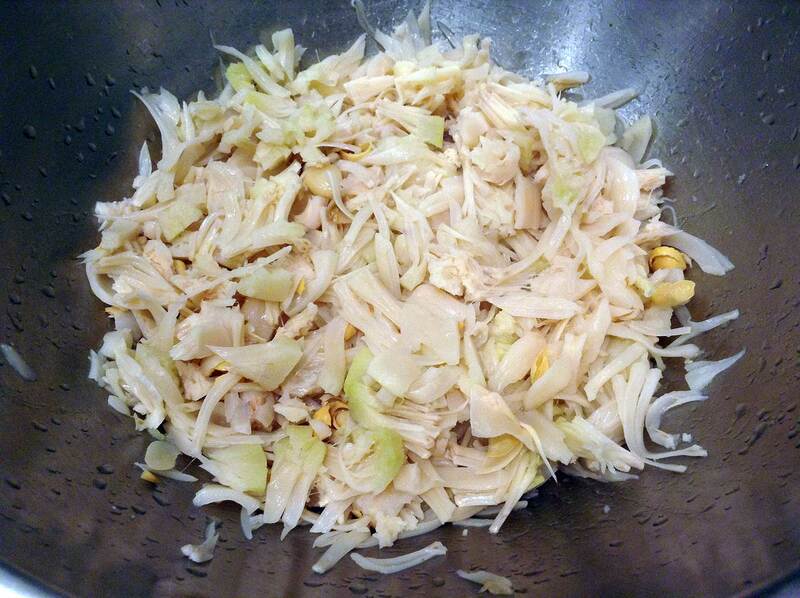 Add the jackfruit to the pan along with the rest of the ingredients and mix well. Cover and simmer for 20-25 minutes until the flavors are blended, stirring as needed. 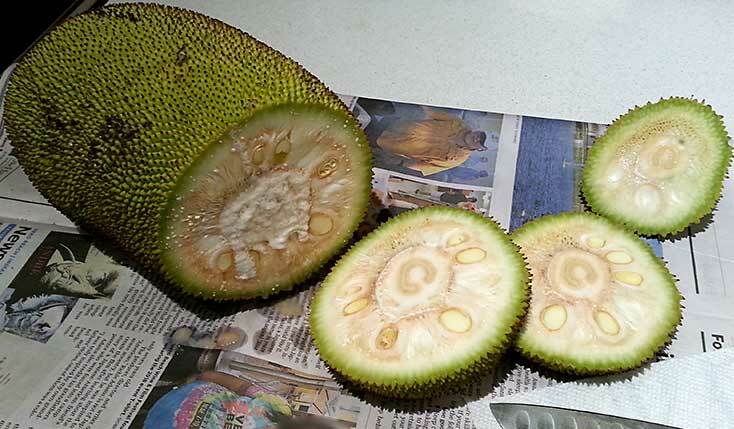 For alternate textures, cut the jackfruit into bite size pieces, without separating the threads. Either cook as is or pre-cook by pan roasting until lightly browned.